Restored to its original glory by the New York City Landmarks Preservation Commission through the efforts of Jacqueline Kennedy Onassis and her daughter Caroline, Grand Central Terminal is one of New York City’s architectural treasures. A mini-city unto itself, Grand Central Terminal bustles all day with commuters, shoppers, diners, and tourists, creating a frenzy endemic to Manhattan. 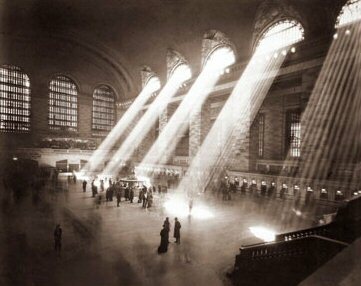 On February 1, Grand Central Terminal celebrates 100 years. A new book, several exhibitions, and a day of festivities all mark this event. 42nd Street and Lexington Avenue, Manhattan. Do you know the whereabouts of the Whispering Gallery or the Campbell Apartment? How about the location of the tennis court in Grand Central? And for 100 points, what's wrong with GCT's beautiful ceiling? Sam Roberts of the New York Times tells all in his chronicle, Grand Central Terminal: How a Train Station Transformed America. Although I can't be sure, I'm guessing that these key points are included among the secrets he shares in the book. I'll add my own as well: Grand Central Market, a foodie market haven with some of the freshest fish, bakery items, and cheeses that you can source anywhere in New York City, and a great variety of prepared dishes. It's a super score if you're dashing to catch your train or subway and need a quick solution for dinner or maybe just a snack. In a new layout built by Lionel, model Metro-North and New York Central trains depart from a miniature Grand Central on a 34’ long, two-level set-up. The show also displays vintage model trains from the Transit Museum’s collection as well as classical railroad posters. An exhibit that shows how Grand Central Terminal shaped modern Manhattan and is setting the tone and pace for its future. This entry was posted on Tuesday, January 22nd, 2013 at 11:34 pm	and is filed under Stuff to Do. You can follow any responses to this entry through the RSS 2.0 feed. You can leave a response, or trackback from your own site.